The cost of higher education keeps rising as it becomes more necessary to be competitive in these difficult economic times, and many business students are looking for cheap online accounting degree programs. With the demand for higher education growing, the growing cost associated with that is becoming a more difficult barrier for many students to overcome. Many students are, however, unaware of the options available to them in the growing field of online education. Many high quality universities have been entering the field of online distance education over the last few years and many of them offer higher education, from the comfort of your own home, for much less than traditional schools. This is a list of the top ten cheapest online Bachelor’s in Accounting programs. Every university on this list is regionally accredited and the schools are ranked by their price alone. Executive Summary: Western Governors University is one of the first non-profit online only universities. The name reflects the fact that it was founded by over 20 former state governors determined to provide quality, affordable online education. The university has always placed a heavy emphasis on innovation, striving to develop new systems and methods of education conducive to the online format. Tuition: The cost of tuition for the Bachelor’s in Accounting program at WGU is $2,890 per six month term. Unique Features: The university charges students based on term instead of credit, so the more credits you take, the less you pay, meaning WGU has the potential to be the least expensive online education option available. The online programs at WGU are ranked #151 according to U.S. News and World Report. Executive Summary: Peru State College is located in Peru, Nebraska. The college’s goal is to provide an affordable education to students that will instill in them a lifelong desire for learning. Tuition: The cost of undergraduate online accounting degree programs at Peru State is $210.00 per credit. Unique Features: Peru State College is the least expensive online education option by a wide margin on a per credit scale. Executive Summary: Athens State is a public university founded in Alabama in 1822. The university strives to provide students with quality options for how they wish to earn their degrees whether they desire to pursue traditional, hybrid campus/online, or fully online programs. Tuition: The online bachelor’s of accounting program costs $240.00 per credit hour. Unique Features: Athens State University is one of the only state universities that offers their online programs at the in-state rate. Executive Summary: Liberty University is one of the largest and best known evangelical Christian universities in the country. Over the past several years Liberty has been expanding its online distance learning options with great success. The school strives not only to educate its students in the mechanics of their profession, but to instill a strong professional ethical point of view. Tuition: The cost of the online bachelor’s in accounting program at Liberty University is $325.00 per credit. Unique Features: Liberty University is ranked #65 among southern regional universities and ranked #109 for among online bachelor programs by U.S. News and World Report. Executive Summary: Colorado State University’s Global Campus is one of the first major online campus initiatives spearheaded by a major state university. The goal of the global campus is to offer strong online programs from a respected school and to innovate in the online education market. Tuition: The cost of the bachelor’s in accounting program at Colorado State University’s Global Campus is $350.00 per credit. Unique Features: Colorado State University is ranked #134 among top national universities and its online programs are ranked #7 for best online bachelor’s programs by U.S. News and World Report. Executive Summary: Bellevue has been one of the pioneers of online education among private non-profit universities. The school has been committed since it began offering programs online to providing an innovative, excellent, education to its distance learning students. Tuition: The cost of Bellevue’s bachelor of science in accounting program is $370.00 per credit. Unique Features: Bellevue University is ranked #9 among best online bachelor’s programs by U.S. News and World Report. Executive Summary: New England College of Business and Finance is a private college, founded in 1909 as the American Banking Institute, and offers only business degree programs. The university may not be a well known household name but its business programs are well respected in the academic communities. Tuition: The cost of the online Bachelor’s in Business Administration with Accounting Concentration program is $1,145.00 per course or an estimated $381.67 per credit. Unique Features: NECF’s finance curriculum was adopted by U.C. Berkeley in 2004 as it was deemed by the leadership there to be one of the top curriculums in the country. Executive Summary: The University of Minnesota Crookston is a public university that has begun developing a very strong online presence. The school strives to provide high quality, affordable, accessible education to hard working students of diverse backgrounds. Tuition: Tuition for UMC’s online Bachelor of Accounting program is $385.77 per credit part time, $5,015.00 per semester full time. Unique Features: University of Minnesota Crookston is ranked #60 for best online bachelor’s programs and #49 among midwest regional colleges. Executive Summary: Franklin University is an urban university with great diversity among its student population. The University was founded in 1902 as a YMCA school and has developed since then into a large private university offering both traditional and online distance courses. 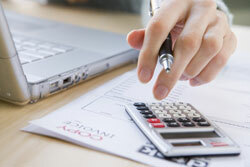 Tuition: The cost of the online Bachelor’s in Accounting at Franklin is $415.00 per credit hour. Unique Features: Franklin University has been named one of the top most military friendly universities in the country by GI: Jobs Military Friendly Schools.